And so Super Skunk was and is nothing else than a Skunk #1 hybrid backcrossed to its Afghani parent. 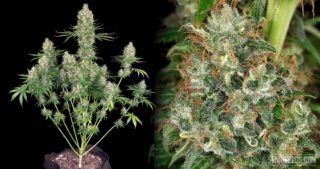 Which saw the light of the day in 1990 and became one of the most popular allround strains of all time, cherished by beginners and pros alike for its enormous potency, fast flowering time, high yields and easy plant management, both indoors and in greenhouses. And now Super Skunk Automatic. With the automatization of flowering, Sensi Seeds further extended the all-round strain profile of Super Skunk. For the breeding process of this autoflowering version, the Sensi breeders tweaked the Super Skunk genetics by recombining its components Skunk #1 and Afghani hash plant with one of their best autoflowering hybrids. Which yielded an 80% indica hybrid with all those desirable properties Super Skunk is famed for, plus autoflowering effect. Sensi Seeds describes Super Skunk Automatic as a strong robust plant with a forgiving nature which makes it ideal for beginners. Starting three to five weeks after germination, its flowering stage is characterized by average stem elongation and shapely sweet aromatic buds full of resin glands that give a good harvest. Once begun, flowering takes 60-65 days, undeviatingly heading toward maturity then, even if the daily light period changes, as for example when the days are getting longer during spring or early summer. That’s why Super Skunk Automatic is a perfect choice for garden or balcony cultivation also, thriving in the warmth and sun of long summer days. 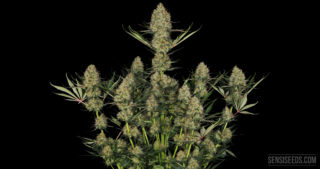 Ellis D. expected a lot from this automated Sensi classic (the more so as it was honoured as the best autoflowering strain at the Highlife Cup 2012), when he germinated two feminised seeds. Which came out of the blocks in a hurry and just like their Skunk #1 Automatic siblings raised their heads above the ground after less than three days. Pampered by the photoperiodically highly efficient LED light emitted by a SANlight S4W unit (20 hours a day), they developed into extremely bushy and heavily branched young plants with strongly pronounced horizontal growth and dark green leaves. After a while, one of the plants started to stretch out to a greater extent than the other, thus adopting a more open growth pattern. As expected (and described by Sensi), the onset of flowering took longer than with the Skunk #1 Automatic plants – after a bit more than 3.5 weeks, one of the plants started to preflower, while the other needed half a week longer for this. At that time, they measured 34 and 44 cm in height. One week later, blooming had fully set in, with knobbly little “roses” having emerged all over the plants, promising buds in abundance. Another two weeks later, the plants were littered with white flower clusters from top to bottom, it seemed as if with all their might they were pursuing a plan headlined “blooming like hell”! A few weeks later, it was about time to happily weigh the dried Super Skunk Automatic buds and smoke them afterwards. Ellis D.’s impression that the two plants had yielded big was proven true when he read 57 and 75 grams from the scales. Commented Ellis D., “an auto strain with such big yields plays in the highest auto harvest league, it doesn’t get much better than that!” The penetrating sweet smell of the buds had not weakened after the drying process – when Ellis D. crushed a small Super Skunk Automatic bud in the grinder, an aroma cloud rose to his face that almost brought tears to his eyes. A nice spliff was quickly prepared, and the first hit gave him a strong sensation of full-mouth smoke savouriness that left a sweetish aftertaste on the exhale – a very familiar and dearly beloved oldschool skunk flavour Ellis D. enjoyed to the fullest. But it wasn’t all about flavourful enjoyments, as after two more tokes, the auto marijuana flexed its potency muscles, putting the effect hammer down. 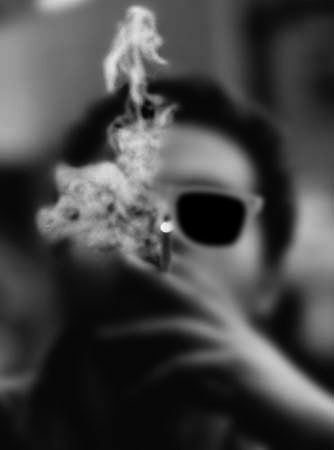 Ellis D. felt as if a THC-rich plume of steam had settled over his head, causing pleasant strong stupefaction that gripped his entire mind, eliminating any troublesome thoughts and leaving nothing behind than cheerful satisfaction and a broad grin – oh happy (stoned) day! Utterly stoned like this, he had difficulties in finishing the whole spliff and then felt totally floored. For almost one hour and three quarters, a deeply relaxed Ellis D. was knocked into his couch before he had to pull himself together and get up again as the doorbell was ringing.